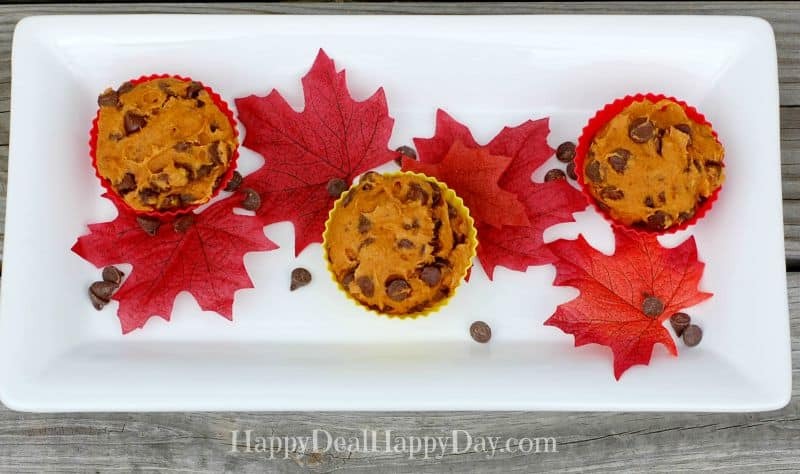 4 Ingredient, Gluten Free, Pumpkin Chocolate Chip Muffins | Happy Deal - Happy Day! 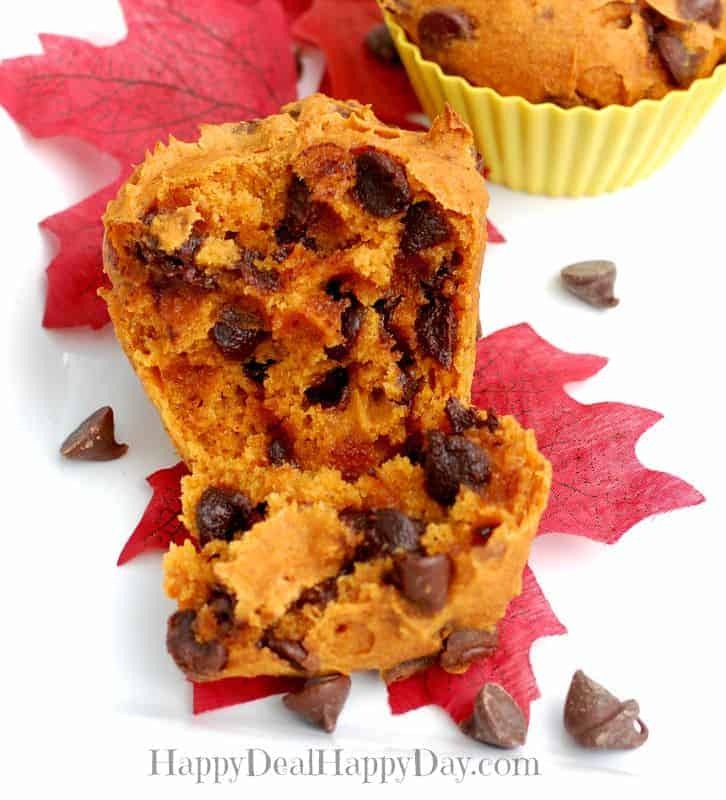 You’ve probably seen the super easy pumpkin muffins/bars you can make using just a spice cake mix and a can of pumpkin. I wanted to whip these up for some friends coming over for dinner that are on a gluten free diet, but realized they were not gluten free. I quickly needed a substitution for this easy recipe. Turns out it’s just as easy and delicious – even if it is gluten free!!! 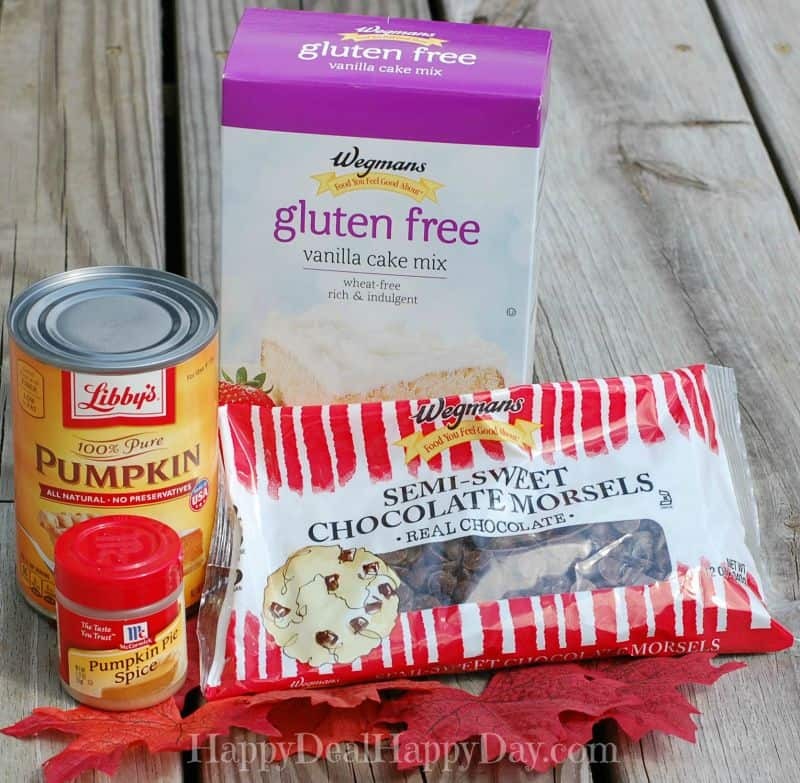 Mix the gluten free white cake mix with 2 and 1/2 teaspoons of pumpkin pie spice. After that is fully mixed, add the 1 can of pumpkin. Stir it well (it will be thick) and fold in the chocolate chips. 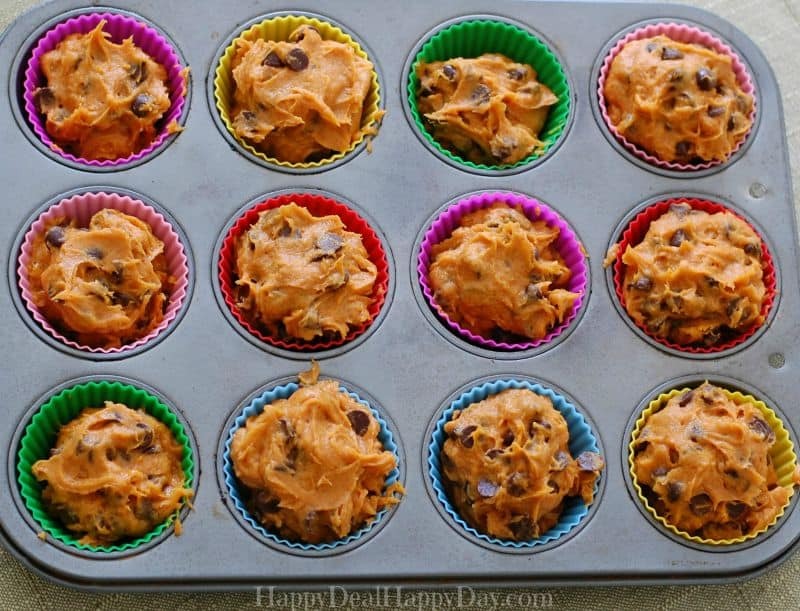 Scoop evenly into un-greased silicone baking cups. If you use paper cupcake liners, you should give each a quick spray of cooking oil. Bake at 350 degrees for 30 minutes. 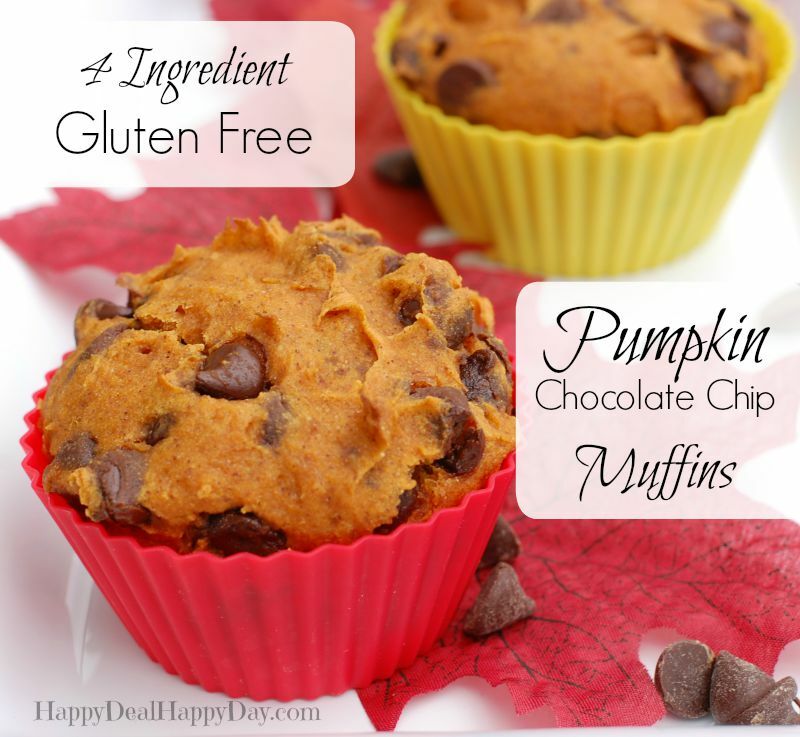 Easy 4 ingredient pumpkin spice and gluten free muffins! Mix the gluten free white cake mix with 2 and ½ teaspoons of pumpkin pie spice. After that is fully mixed, add the 1 can of pumpkin. Stir it well (it will be thick) and fold in the chocolate chips. Scoop evenly into un-greased silicone baking cups. If you use paper cupcake liners, you should give each a quick spray of cooking oil. 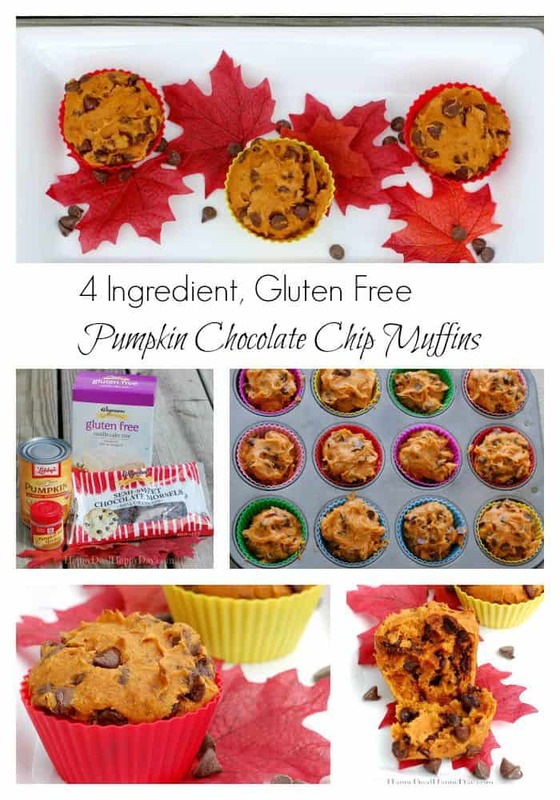 Check out this similar recipe for Frosted Pumpkin Bars! 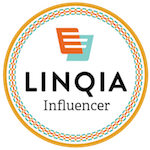 ← Pumpkin Spice Everything – 15+ Pumpkin Spice Foods, Apparel & More! This is awesome! I always wondered how well GF cake mixes might work with these shortcut-type recipes, and I never really wanted to spend the money or time to try. So good to know this one works. Jacob will love it (and if he’s having a crazy moment and doesn’t, I know I will! )!